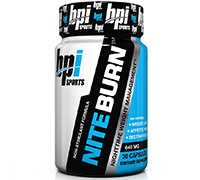 BPI SPORTS NITE BURN is a non-stimulant fat burner that helps you achieve optimal amounts of sleep and accelerates fat loss while you sleep! BURN FAT & RECOVER WHILE YOU SLEEP LIKE A BABY!! NITE BURN™ promotes relaxation and can act as a sleep aid. 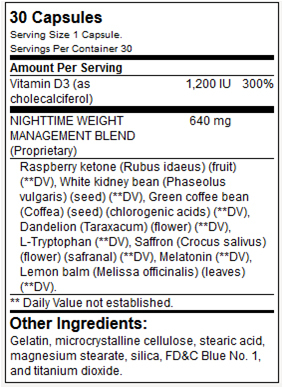 Raspberry Ketones are used within the formula to help stimulate your metabolism to promote fat loss! This formula helps balance blood sugar levels which may help the body burn fat and promote lean muscle building instead of storing it in the body. Designed to work while you sleep, NITE BURN™ promotes fat burning, muscle recovery, and improved sleep patterns so you wake up feeling refreshed and ready for your day. Suggested Use: For best results, take one (1) capsule prior to bedtime, or as suggested by a qualified healthcare practitioner.